Train Jam is a collection of developers traveling via train to the Game Developers Conference and creating games during the ~52 hours it takes to arrive in San Francisco from Chicago. This is the 2018 edition of Train Jam! 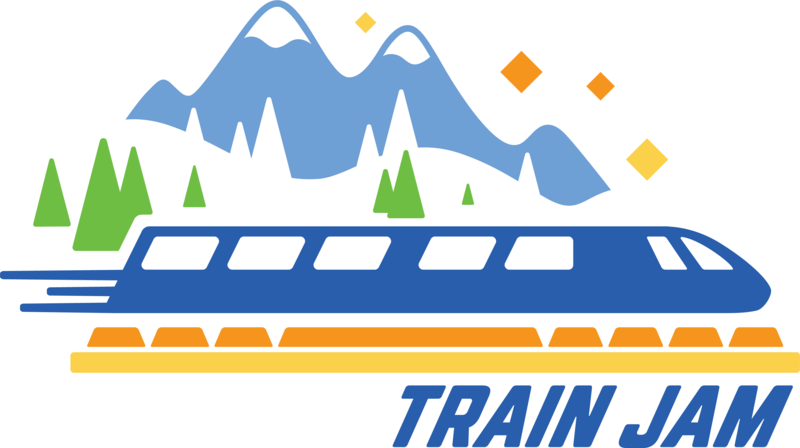 Choo choo your way to high morale on the TrainJam. What kind of soup will you make? Battle to see who gets to adopt these wonderful dogs! Be a turtle and drive around if you want. Or don't do that! Walk 30 miles in real-time. Nothing else happens. Developed for Train Jam 2019. The ultimate elevator riding experience! A heart-breaking game about momentum! Make this the most absurd murder! made for Train Jam 2019! You want to be together, but it doesn’t seem possible. An educational game where you spell words and shoot them on a train. A dog with a kite... and a mission! Escape a crazy colourful lab in this cutely drawn puzzle game. Climb your way to the top whilst smelling the roses! Going for a joyride! Avoid the potholes and leave the city before the police catch you. Call some people to find your lost purse. How we make games ... really. Collect Ghost stories in a Museum as a Ghost Detective! Save your brother before the train arrives! Don't let it be his last ride. Get close...but not too close. Drift across a maze collecting points and maintaining fuel. Lot in Life is a deck building game that has you play through someone’s life.